Empathy. They can imagine the world from multiple perspectives—those of colleagues, clients, end users, and customers (current and prospective). By taking a “people ﬁrst” approach, design thinkers can imagine solutions that are inherently desirable and meet explicit or latent needs. Great design thinkers observe the world in minute detail. They notice things that others do not and use their insights to inspire innovation. Experimentalism. Signiﬁcant innovations don’t come from incremental tweaks. 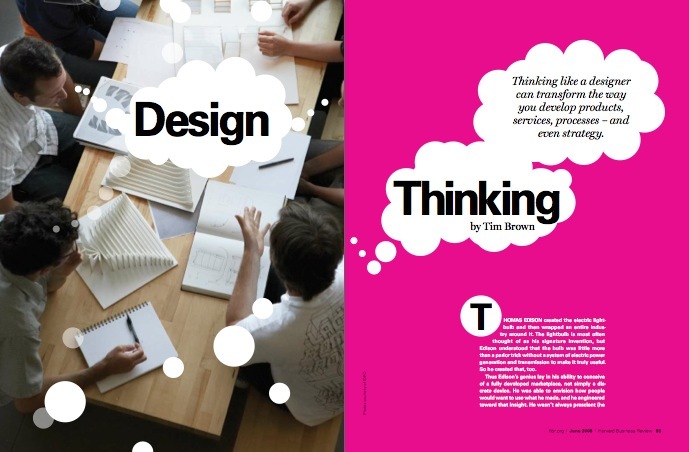 Design thinkers pose questions and explore constraints in creative ways that proceed in entirely new directions. Collaboration. The increasing complexity of products, services, and experiences has replaced the myth of the lone creative genius with the reality of the enthusiastic interdisciplinary collaborator. The best design thinkers don’t simply work alongside other disciplines; many of them have signiﬁcant experience in more than one. At IDEO we employ people who are engineers and marketers, anthropologists and industrial designers, architects and psychologists. While this is a neat description, training people to act accordingly is another matter. I offer tools for doing this. Like NEW Integrative Thinking at http://www.integrative-thinking.com.